How to pay for broken home appliance now? Cashfloat expedite payday loans can help you replace or repair home appliances fast. What’s going on?! There’s frost building up at the back of your fridge, it’s making loud and disturbing noises, the food is going off – something’s wrong here. It’s not meant to be like this!. We’ve all been through broken appliances. Whether it’s your fridge/freezer, washing machine, dryer or oven, getting it back in working order is a priority. WHY IS MY WASHING MACHINE BROKEN? With no washing machine, you’ll probably be making quite a few trips to the nearest laundromat in order to have clean clothes and linen. This will work out to be quite expensive pretty soon, so you’ll want to repair or replace it as soon as possible. WHAT IS WRONG WITH MY FRIDGE? If you haven’t got a working fridge or freezer, you won’t be able to stock cold or frozen foods, such as milk, fish and meat. You can’t keep leftovers for the next day, and your fruit and veg won’t last for very long. A working fridge/freezer is a priority! WHY DID MY OVEN STOP WORKING? Eating takeout every day is fun! Unfortunately, it’s not usually healthy, and always expensive. Ovens that come with the stove on top are useful, but when they’re broken, you’re stuck without any cooked food. Better get that oven range fixed! Don’t panic when your appliance breaks; we’ve got you covered. Check that it’s plugged in, and that any filters/vents are cleaned. Read the user manuel or look online to see if you can fix it yourself. Find out the real costs or either repairing or replacing, including all expenses. If your machine is old, it may be more worth it to replace it rather than repair. Can I do it myself? You can attempt to diagnose and fix the problem yourself, which will save you time and money. Do I repair or replace? 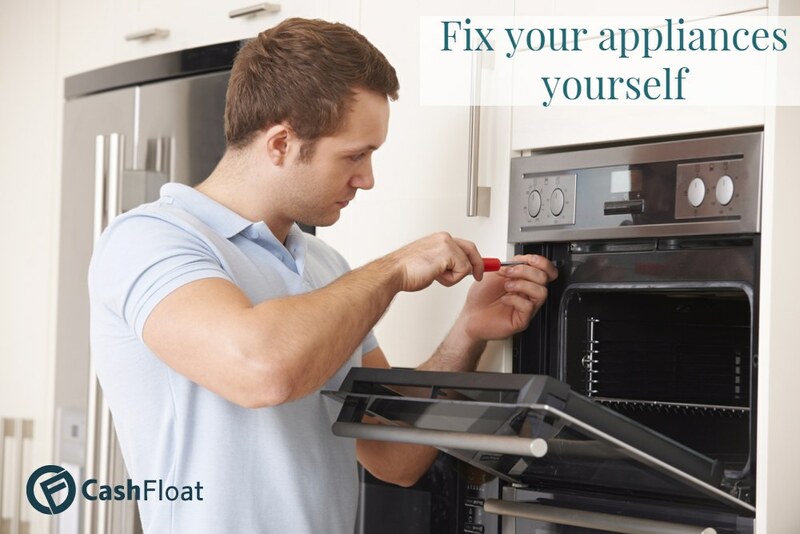 If you can’t do it yourself, you have to decide: will you repair or replace the appliance? How will I pay for it? Once you’ve hired the handyman or picked out the model you want, you have to figure out how to finance it. Let’s go through this plan step by step. 1. Can I do it myself? First of all, run through the basics. Is your appliance plugged in properly? Could it be that the vent or filter needs cleaning? It won’t hurt to check, but you will feel foolish if the handyman comes and simply pushes in the plug. Next, check to see if your appliance is still covered by the warrantee. If so, there you go! Problem solved! If not, continue reading. Make sure the appliance is unplugged – you don’t want to electrocute yourself! Check the warrantee. Often, if you’ve fiddled with it, they won’t replace it. If you’re trying to move a big and heavy machine, be careful not to get hurt. 2. Do I repair or replace? Before you even begin to think about this, make sure you know exactly how much either option will cost. Find out how much your handyman charges and what is included in that fee. If it’s a small repair that will take less than an hour, they may have a flat rate for it instead of an hourly one. Will your new appliance fit? If your old one had cabinets right next to it, you may find that the new one won’t fit. Re-arranging your cabinets can work out to be fairly expensive. If you’re ordering a gas cooker or dryer, does your home already have gas connections? This could cost thousands to set up. Now that you know the costs of either option, you have to decide which option will be better in the long term. There are a few factors to consider when deciding whether to replace or repair your appliance. How efficient is my appliance? If your appliance is old and using up a lot of energy, you could potentially save hundreds of pounds on your bills by replacing it. For example, a modern refrigerator uses up about half of the electricity that one built 20 years ago uses. However, look at how much you will be spending, as well as saving. You may end up spending thousands in order to save a few hundred, if you’re lucky. On average, if you’re going to be staying in that place for the next 10-15 years, it may be more worth your while to replace now. If you’ll anyway be moving on soon, you may as well just repair your old appliance. How old is my appliance? Appliances do not last forever. They have an average useful lifespan after which they may stop working at any time. The closer the appliance is to the end of its average useful lifespan, the wiser it is to just replace it, rather than repair it. Remember, if you’ve taken good care of your appliance, it is more likely to last for much longer than average. Make sure to read our article about how to take care of your appliances. How much do I like my appliance? Maybe you just love your washing machine. It looks cool, it’s super easy to use, it’s quiet and quick, it has great features – it’s the washing machine of your dreams! There’s no guarantee the new one will be as awesome as the old one. It may be worth repairing it so you get to enjoy it for longer. If your finances are really tight, replacing your appliance may be out of your grasp anyway. If you can afford it, replacing may be the better option – of course, once you’ve looked at all the other factors mentioned above. We will discuss this point more in the next section. 3. How will I pay for it? You may be lucky enough to have plenty of money available, in which case you simply have to decide whether to pay by cash or card.Most of us, however, cannot simply swipe off a purchase of hundreds or thousands of pounds without thinking twice. The question of how to pay for it requires some serious thinking. If you have an emergency fund, use it. That’s what it’s there for. Use that money, and then rebuild the fund as soon as you can. Will I be able to pay it back? Do you have more money coming in soon? Are your wages enough to cover this plus your regular expenses, or is there a big bonus heading your way in the near future? If you don’t know where the money will come from, don’t borrow. Either find a cheaper model or repair it instead. Can I borrow from friends or family? If you can borrow from someone without paying interest, go for it. However, if you think this may jeopardise your relationship, it may not be worth it. If not, what is my cheapest loan option? Can you arrange an overdraft with your bank? If not, you can look into getting cheap short term loans online. Make sure you can trust the lender. Only use an FCA-authorised lender, and make sure the website is secure. You can read more about this in our free online loan safety guide. Don’t go with the first company you see; it may not be the cheapest option. Look around first, and compare the prices. Check out our loan comparison guide for more information. Read the terms and conditions carefully before applying for a loan. Do you know what will happen if you can’t repay it on time? Or if you repay early? To read about Hurricane Harvey and to learn why you should have an emergency fund, click here.